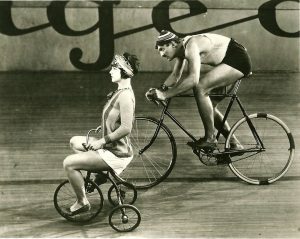 Viola Dana rides a trike, Maurice B. Flynn rides a bike. Happy Thanksgiving! Rides a Bike is two years old today, with a book and an iPad app (the perfect holiday gifts)! Thanks for all the support and enthusiasm and for following this ongoing celebration of cycling and cinema. Ride on, and have some turkey – or tofurkey!